Practice Area: Wide open driving range with grass tees, large putting green. Description: The 6,906-yard par 72 Clyde Johnston-designed layout is located on a heavily wooded and hilly site just over the South Carolina border in Fort Mill. 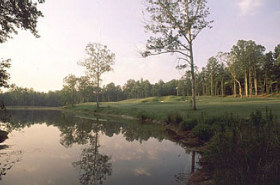 The course features 4 holes that flank Sugar Creek, affording players spectacular views and includes 13 holes that play across and along perennial streams that feed into the Catawba River. Each hole offers 5 tees for different skill levels. The greens were converted to MiniVerde Ultradwarf in 2010. B-Man's Take: I've only played this course a couple of times, but I need to get out here more often. 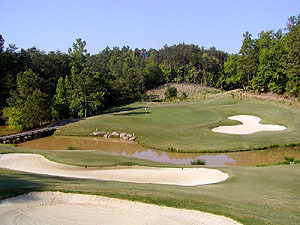 It is a well-kept course with lots of challenge and several unique holes. Pretty straightforward layout, with elevation changes and rolling hills the most common features. Look for twilight times and discounts to keep it affordable. My favorite hole is #10, a short but picturesque par-4 with a lake on the left side and an elevated green guarded by 3 large bunkers. There are a handful of devilish holes, including the #1 handicap 428yd 7th hole. This long par 4 will give you a long approach to an elevated green guarded by a creek in front. 5/18/18 - Msg Board Posting by BetterThanMost titled "Springfield Golf Club Update"